When you’re two hours away from a decent pickle (think Gus’s in the city), your CSA has pickling cucumbers and all the dill you can pick, making your own sour pickles seems like a pretty good idea. The Accidental Locavore found a couple of recipes that looked easy and interesting, so five pounds of cucumbers were quickly dispatched. The first was a recipe for half-sours that I found on Fine Cooking. It was pretty simple, just requiring a little patience (something not normally on my top-ten list of attributes) to let them sit and become pickles. I made four quart jars and let them sit in the basement to cure. 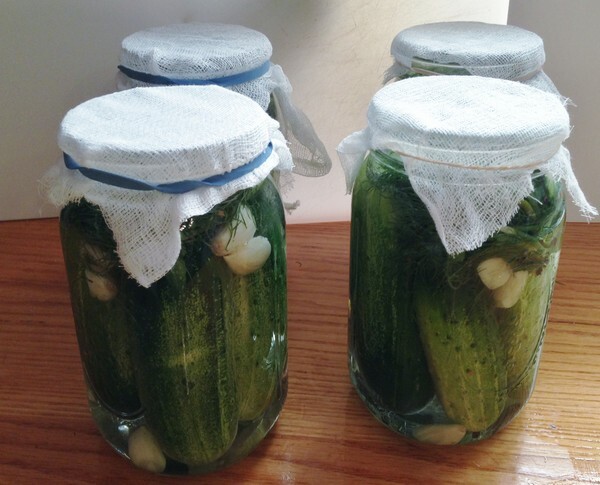 While I was waiting for them to ferment, I came across an intriguing recipe from Smitten Kitchen. It was so quick and easy I just had to give it a shot. 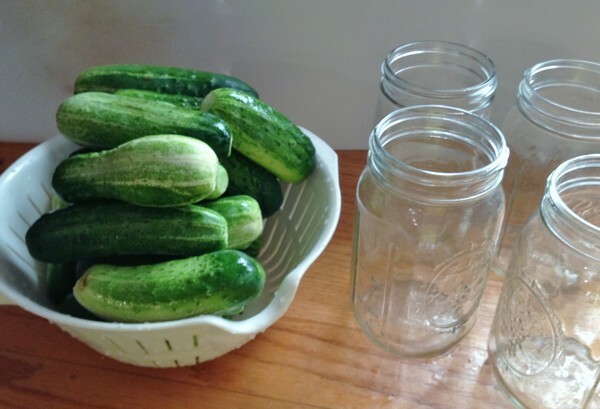 There were two decent sized cucumbers left from the five pounds, so I found a couple more jars and went to work. 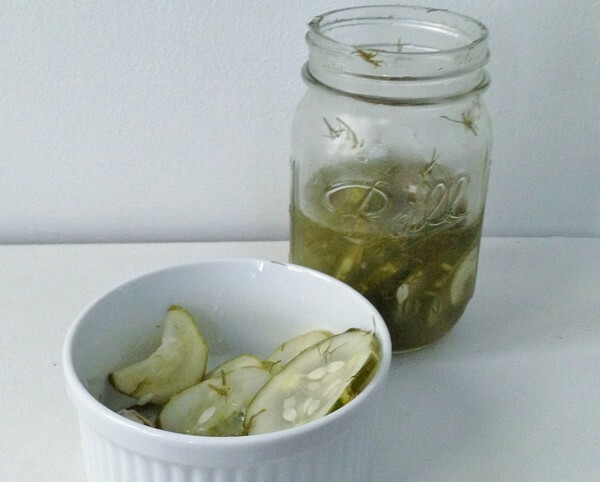 For her recipe, all you do is thinly slice pickling cucumbers, put them in a jar with ½ cup of white vinegar and 5 teaspoons of kosher or pickling salt and a tablespoon or two of chopped dill. Cover the jar, give it a good shake, and put it in the front of the refrigerator. Every time you open the fridge, shake the jar. Supposedly, they’re good after about 2 hours; I let mine sit overnight before tasting them. My verdict: The Smitten Kitchen pickles were great! Couldn’t be easier, and I can’t wait to try them on a burger or our Cubanos. I added a smashed clove of garlic to each jar, but that’s optional. There are lots of ways you could vary them – different vinegars, pickling spice, different veggies (maybe lightly blanched). You should definitely give this a shot, it’s too easy and good not to! If you do a smaller recipe, like we did, with a couple of cucumbers, I would cut down the salt to maybe 3 teaspoons. My half-sours were a bit more problematic. While they tasted like a good deli pickle, in the fermenting process mold developed on the top of the jars and sadly I had to dump them. When I was talking to Ethel at the farmers’ market about them, she and her associate thought that it was probably because they weren’t properly submerged. They suggested wadding up a piece of plastic wrap and putting it in the top of the jar to keep everything submerged. Since pickling cucumbers and dill are plentiful at my CSA, stay tuned, there will definitely be another batch coming soon. Update: Now the really quick ones can always be found in my fridge. I use the 1/2 cup of vinegar, but only a scant tablespoon of salt. And, since I’ve discovered Kraut Source, the fermented pickles have come out great! John, when I print one of her recipes, I highlight the part I want and just paste that into a blank document. Otherwise, like you said you get comments, ads etc. Anne, tell your readers that if they print a recipe they get all the comments from smitten kitten. I just printed a 1 page recipe and got 40 pages of comments! hope the pickles are good. btw, welcome back, long time no see.